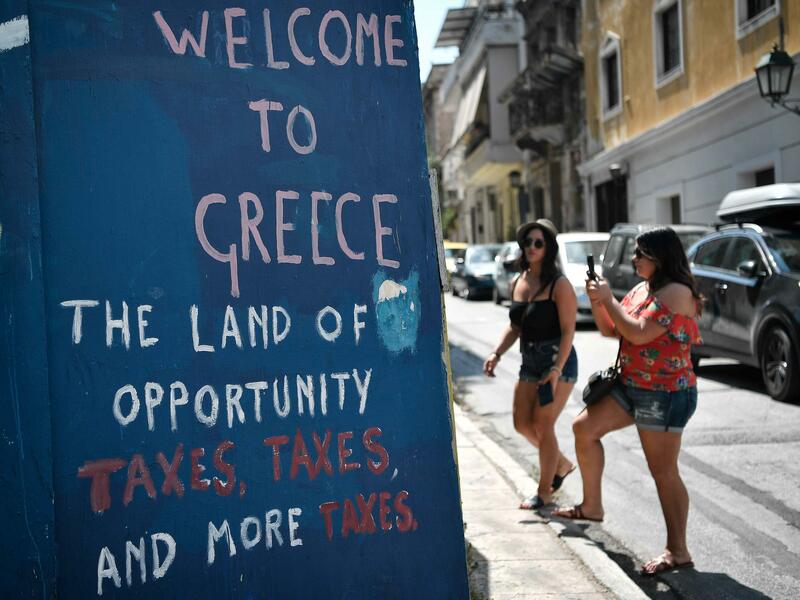 Tourists take pictures of slogans on a wall in central Athens on Satuday. Greece's third and final bailout officially ends on Monday after years of hugely unpopular and stinging austerity measures. Greece has successfully completed its final three-year installment of an international bailout program, allowing it to reclaim a degree of control over its finances, which have been overseen since 2010 by the European Union, European Central Bank and International Monetary Fund. Athens exits its third bailout on Monday after a protracted debt crisis that forced it to implement painful austerity measures — including deep cuts to social welfare programs — to receive emergency loans. "Today we can safely conclude the [European Stability Mechanism] program with no more follow-up rescue programs as, for the first time since early 2010, Greece can stand on its own feet," Mário Centeno, the chairman of the ESM's board of governors, said in a statement reported by Reuters. "This was possible thanks to the extraordinary effort of the Greek people, the good cooperation with the current Greek government and the support of European partners through loans and debt relief," he said. Reuters notes, "The ESM has disbursed 61.9 billion euros over three years in support of macroeconomic adjustment and bank recapitalisation. A further 24.1 billion euros that was available to Athens under the programme was not needed, the fund said." However, the European Commission will continue to closely monitor Greece's finances in order to ensure that Athens does not backslide. Although Portugal, Spain and Cyprus have also borrowed from the ESM, Greece's troubles have been worse, according to officials. "Greece is exceptional. It has received much more loans from us than any other country," ESM Managing Director Klaus Regling told Ethnos newspaper in an interview. "No other program country has received anything comparable. Therefore, the monitoring will be tighter than in the other cases and this will take the form of the so-called enhanced surveillance." According to The Financial Times, "EU officials speak of two main potential scenarios for the next 15 years. In one, a solvent but 'stagnating' Greece is still burdened by stubbornly high debt and unemployment. The other, brighter picture, is of a reinvigorated economy as Greece shakes off legacy problems."